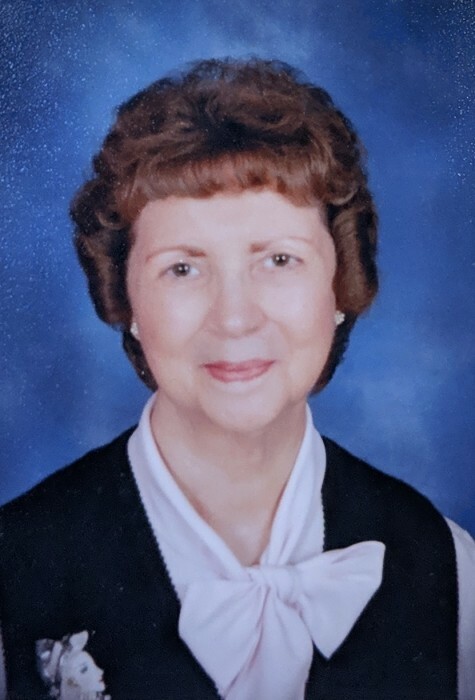 YVieta LaRue (Brown) Jenkins, 82, of Liberty, Missouri, passed away on March 21, 2019. A Celebration of Life will be held at the Claycomo Baptist Church on Tuesday, March 26th at 10:30am, with visitation beginning at 9:30am, and burial to follow at Terrace Park Cemetery. YVieta was born on October 3, 1936 in Altamont, MO to John Weaver and Alberta LaRue (Beck) Brown. She attended school in Gallatin, MO, graduating from Gallatin H.S. in 1954. While in high school she played the trombone in the marching band. After graduation, YVieta attended S.W. Baptist College in Bolivar, MO from 1954-1956 and received her Teaching Certificate. She then spent two summers receiving education classes in Kirksville State Teacher’s College. She taught 4th, 5th, and 6th grades at New York Consolidated Schools in Missouri and taught in Cowgill, MO. YVieta met Billie Don Jenkins in the summer of 1956. They were married on December 21, 1957 at the First Baptist Church of Gallatin, MO. YVieta and Bill moved to Kansas City North in 1961. There YVieta was a homemaker caring for her two daughters, Jeanna, born in 1959, and Janey, born in 1962. YVieta was active in the PTA at the girls’ elementary school, Golden Oakes. She served as a room mother in their classes for several years and was the PTA president for two years. She was also active with the girls’ Brownie Troop, serving one year as the Girl Scout Cookie Chairman, ending up with at least 600 boxes of cookies in her house to distribute to the troop! She worked for 10 years as a substitute teacher in the NKC School District. YVieta has been a proud member of the Claycomo Baptist Church since she joined back in 1961. While there she spent many years serving as a Sunday school teacher and Women’s Missionary Union director. Up until recently she was the Sunday school teacher in the Ruth class, with as many as 25 active members. As missions director she enjoyed role-playing as the famous missionaries Lottie Moon and Annie Armstrong to help raise money for mission work. Her passions were her family and church. She faithfully cared for Bill through his long illness and loved spending time with her four granddaughters. Throughout the years she also enjoyed reading, Bible study, crocheting, researching family genealogy, and music, which included playing the piano and autoharp. YVieta is preceded in death by her parents; husband of 53 years, Bill Jenkins; and granddaughter, Jessica. She will be greatly missed and fondly remembered by her daughters, Jeanna Jaeger and Janey Taylor (Bernie); granddaughters, Melissa Etzenhouser (Shawn), Beth Jaeger, and Erica Reyes (Earl); four great-grandchildren, Kylah Etzenhouser, Nathanial Reyes, Hunter Etzenhouser, and Christian Reyes; sister-in-laws, Carol Jean Stephens and Sue Fisher; brother-in-laws, Bob Stephens and Everett Fisher; as well as numerous nieces, nephews, cousins, and friends. She was much loved and will be missed by all. In lieu of flowers, contributions may be made to the International Missions Board.